The City is planning a new road in the Emery Village neighbourhood to connect Toryork Drive with Finch Avenue West. This new road, currently referred to as “Link 2A,” follows the recommendations made in the 2009 Emery Village Transportation Master Plan. The City will proceed with planning for the detailed design of Road 2A in accordance with recommendations made in the Environmental Study Report. The 30-day review period started December 6th, 2016 and closed on January 19th, 2017. To request assistance with viewing these documents, please contact the person listed in the Contact Information section of this page. The Emery Village Link 2A Environmental Assessment builds on the Emery Village Transporation Master Plan to plan a new road that connects Toryork Drive and Finch Avenue West. The new road will be two-lanes wide, with one lane moving in each direction and sidewalks on both sides. In 2009, the City completed the Emery Village Transportation Master Plan. This long-range plan identifies the required transportation infrastructure to support existing and future development in Emery Village. 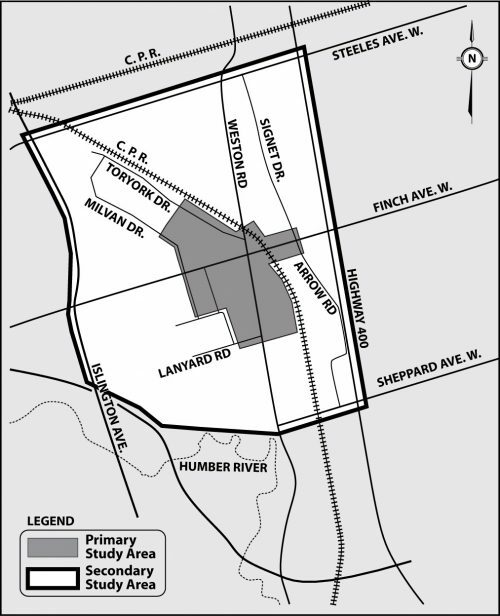 One of the six key recommendations of the Transportation Master Plan is to create “a new road connecting Toryork Drive with Finch Avenue West.” Emery Village Link 2A meets this recommendation. The Transportation Master Plan identifies Link 2A as an opportunity to increase access for future development and reduce traffic congestion in the area. The Emery Village Transportation Master Plan follows the implementation of the Emery Village Secondary Plan, which was completed in 2002. The goal of the Secondary Plan is to provide for mixed-use development in the area and encourage a “village-like” setting. To implement this vision, the Secondary Plan recommends improving the streetscapes and providing a connected street system for vehicles, bicycles, and pedestrians. In 2011, the City began work on the Emery Village Link 2A Environmental Assessment. A staff report on the study recommendations was presented to a committee of City Council called Public Works & Infrastructure Committee (PWIC) on April 25, 2016. Interested members of the public had the opportunity to arrange to speak or submit comments to PWIC. The City hosted an open house on Wednesday, July 29, 2015 at the Carmine Stefano Community Centre. Attendees learned about the new road, asked questions, and provided valuable feedback. Thank you to everyone who attended. Comments were accepted until August 15, 2015. Based on comments received and a review of feasibility, the City now recommends Option 1, with modifications. Option 1 is primarily on City-owned land. View the recommended Option 1 alignment. Why is the City building this road? Emery Village Link 2A will provide a connection between Toryork Road and Finch Avenue West and will benefit vehicular traffic and pedestrian movement in the Emery Village area. The new road will provide a needed alternative route for heavy truck traffic, especially vehicles that currently make left turns from the southbound Weston Road to Finch Avenue West in order to reach Highway 400. It will also increase vehicular access for future development in the area, and reduce traffic congestion. The new road will establish a signalized intersection with Finch Avenue West, providing a pedestrian crossing opportunity to and from Lindy Lou Park. It will include sidewalks and boulevards to enhance the pedestrian experience. Emery Village Link 2A was recommended by the Emery Village Transportation Master Plan (2009) and the Emery Village Secondary Plan (2002). There is no current funding in the City’s Capital Works budget. As such a time line for the design and construction of this project is not yet known. Will the new road provide pedestrian crossings? A signalized intersection will be created at Finch Avenue West and the new road link. Pedestrians will have the opportunity to cross at this location providing easy access to Lindy Lou Park and another crossing opportunity between Weston Road and Jayzel Drive where one does not currently exist. Will the new road include bike lanes? Emery Village Link 2A does not include plans for bike lanes. However, cyclists are welcome to travel on the new road. The City encourages cycling on all city streets. Will trees or open spaces be affected? The new road will affect three private properties. Some trees will be affected, however the Emery Yard and TRCA lands will not beencroached upon by this new road.